Process EMLX to HTML in a simple manner! You are here: CoolUtils > Total Mail Converter > Process EMLX to HTML in a simple manner! EMLX is used for storing mails by OS X mailing software. Reading EMLX files on any operating system becomes possible after converting them to more common formats. You can convert EMLX to HTML and open in any web browser or text editor for reading. To do this you need Total Mail Converter. 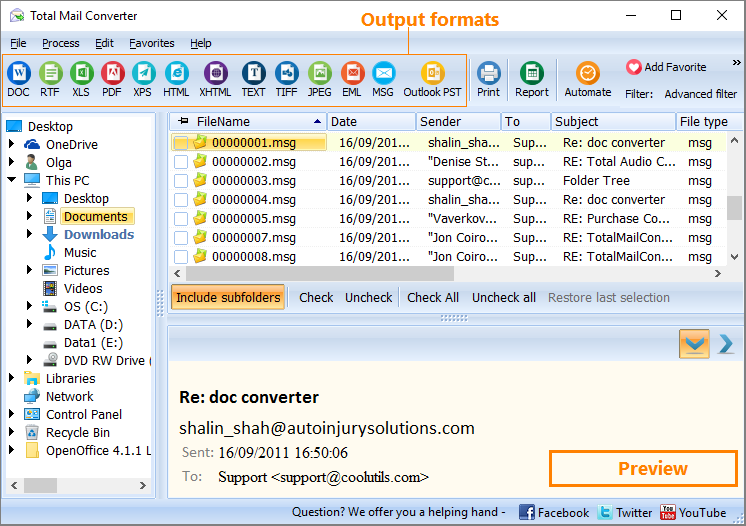 Total Mail Converter supports MSG, EML and EMLX input formats and helps to extract information from them into different types of documents and images, such as: HTML, PDF, TXT, TIFF, DOC, JPEG, RTF. Also there is ability to switch between different mail formats (PST, EML, EMLX) for importing emails from one mail client to another. 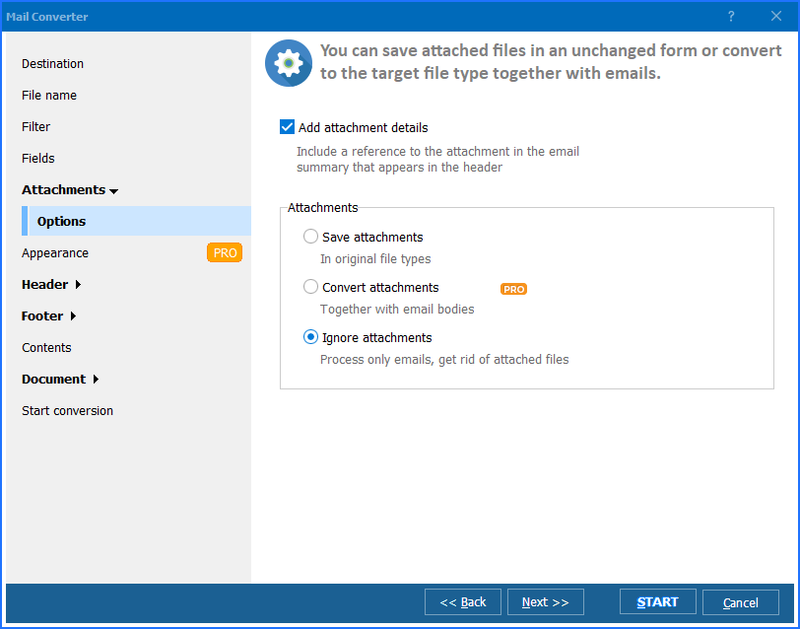 Total Mail Converter provides basic features for saving attachments. If your emails in EMLX contain attached messages or graphic files, this mail converter offers a few options. 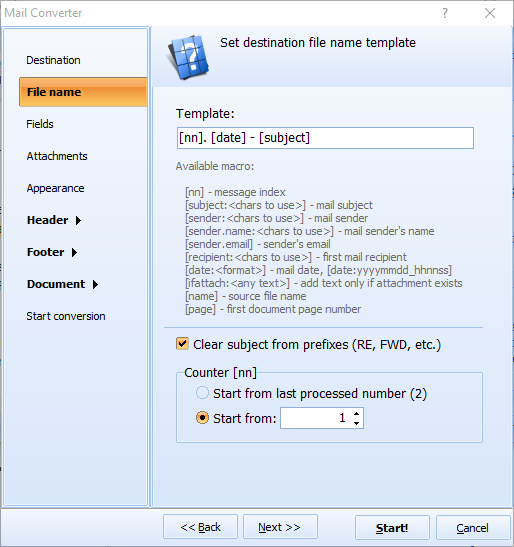 Attached messages can be converted to HTML too, and attached images can be either inserted into the HTML mail copy or saved into a folder in their original format. One more useful add-on is ability to apply external CSS scheme to the desired HTML copies from the file. Just set the CSS file location in settings and get your HTML copies properly styled. By default (if not to change any settings manually) the program will simply port data to files in the target format. It will save EMLX as HTML pages, converting the entire emails one per file. You can convert all sources into one HTML file by activating the 'Combine' option in the settings wizard. To convert specific EMLX fields instead of the whole file, you need to uncheck the unnecessary fields in settings. 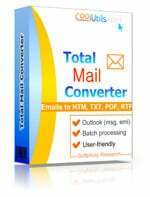 Download Total Mail Converter in free trial to test EMLX conversion on real files.